flooded woods for catfish bait. The year 2011 will go down in history as one of the worst flood years ever along big rivers like the Mississippi, Missouri, Atchafalaya and their tributaries. People have suffered a terrible toll in lost lives and property. Wildlife has suffered, too. Because the ground in big-river floodplains is low and flat, a rise in river level of only a few inches can flood literally thousands of acres of bottomlands. 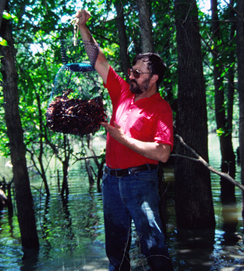 As water rises and woodlands flood, a new food source — terrestrial crayfish — becomes available to catfish. Crayfish are abundant in most bottomland hardwood forests, but most of the year they live on land and are inaccessible to catfish. During overflow periods, however, the crayfish must live in an aquatic environment, and catfish are drawn to them like kids to a candy store. Flatheads, blues and channel cats all join the feeding frenzy, moving from rivers, lakes and bayous into shallow water that now inundates many acres of bottoms. They will feed here as long as water is high enough to swim in, sometimes for several months. Fishermen have long been familiar with this phenomenon and practice a form of fishing known as “woods fishing” to take advantage of it. Few cat fans are familiar with the tactic today, but in the early twentieth century, it was widely practiced in the lower Mississippi River Valley. D.S. Jordan and B.W. Evermann wrote about this unique sport in their 1923 book, American Food and Game Fishes. “During the spring rise in the Mississippi hundreds of square miles of the adjacent country become flooded, and then the catfish leave the rivers, lakes and bayous, and ‘take to the woods,’” they said. “Here the fishermen follow them, and ‘woods’ or ‘swamp’ fishing is resorted to. Short ‘brush’ lines with single hooks are tied to limbs of trees here and there through the forest, in such a way as to allow the hook to hang about six inches under water. The trees selected are usually those along the edges of the ‘float’ roads, and, that he may readily find his lines again, the fisherman ties a white rag to each tree to which he has attached a line. on the bounty to the point they often can swallow nothing more. In more recent years, fisheries researchers also have studied this phenomenon. 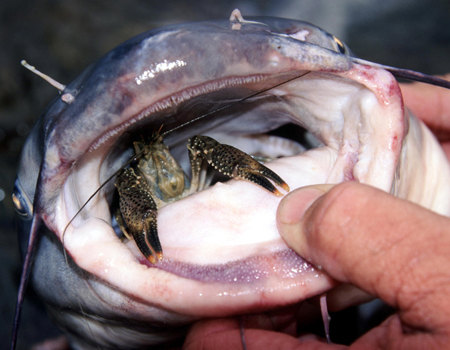 For example, Don Jackson and Joe Flotemersch, researchers at Mississippi State University, learned that peak use of crayfish occurs prior to egg occurrence in channel catfish. And because the crayfish are excellent sources of essential amino and fatty acids, they are likely to be significant resources for egg development. In other words, when rivers overflow and catfish can feed on crayfish, they produce more eggs. As a result, during flood years, these river ecosystems produce astounding numbers of catfish that later are available for anglers to catch. Floods certainly are devastating in many ways, but for catfish anglers, flooding brings better fishing, and lemons are made into lemonade.